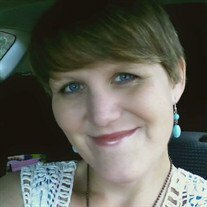 Emily Elizabeth Koone, age 30, of Marshall, NC, died Thursday, March 15, 2018, at Hospice House of Rutherford County. Emily was a member of Gilkey United Methodist Church. She was formerly from Union Mills. Emily had a long courageous battle with cancer. She was a graduate of N. C. State Univerisity and was a member of the Sigma Alpha Soroity. She was employed by the USDA as soil conservationist. She loved the outdoors and enjoyed hiking, fishing, kayaking and camping. Emily was active in the Girl Scouts and became a Girl Scout leader. She was preceded in death by her nephew Sonny Hendrix, grandparents; Jack & Vergie Bridges and Charles and Mary Koone. DeWalt Koone and Shirley Bridges Koone. Nieces: Ada Hendrix and Ella Hendrix. Aunts and uncles: Jim and Jackie Bridges, Chris and Marie Koone, Forest and Joan Koone. The family will receive friends from 4:00 PM to 6:00 PM, Sunday, at McMahn's Funeral Home. Celebration of her life service will be at Gilkey United Methodist Church at 1:00 PM, Monday, March 19, 2018 with Reverend Jack Bridges officiating. Interment will be at Gilkey United Methodist Church Cemetery. Memorials may be made to Gilkey UMC; c/o Shannon Buckley; 730 Freemantown Road; Rutherfordton, NC 28139. Online guest register available at www.mcmahansfuneralhome.com. McMahan's Funeral Home & Cremation Services in charge of arrangements.